Friday should be like this, standing in a queue for your time to come to have the conference kit while you enjoy the ambiance of a management college and not a five-star hotel. 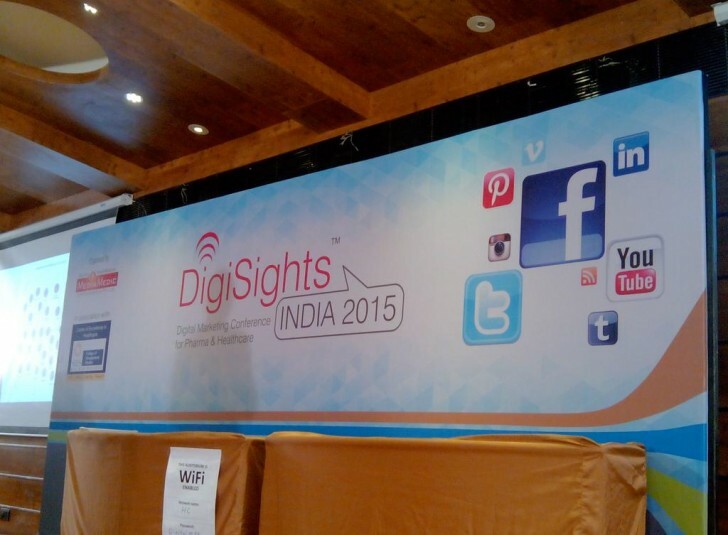 The second edition of DigiSights 2015 organized by MediaMedic is happening today and it is happening with the people of the future i.e. in the campus of SIES College of Management Studies, Mumbai. Lighthouse Insights is glad to be a part of the second edition, after an earlier alliance of its first edition in 2013. By 10 in the morning the conference room was giving the feel of an early January morning already buzzing with students decked up in their suits and professionals shaking hands with their cups of tea. The day started with slight entertainment and thereafter Priti Mohile, Director at MediaMedic took the stage to commence #DigiSights 2015. She invited Dr. A. K. Sengupta, dressed in an Indian outfit (good to see that at times) to share a few words. Dr. Sengupta started his brisk thoughts by inviting all the participants and students to the event. Dr. Sengupta – Mentor at SIESCOMS talked about the problems in Pharma including services not reaching to the last mile. However, he is positive about digital and stressed on digital reaching to the last mile in local languages. Prof. Suniel Deshpande joined after Dr. Sengupta. Before sharing his story Prof. Deshpande commented that 2015 started on a good note with Kiran Bedi joining BJP, leaving the audience with a smile and the DigiSights event happening again and that too in association with SIESCOMS. In the 20th year SIESCOMS has been one of the first as the Centre of Excellence in Healthcare. With digital revolution engulfing India right now, Prof. Deshpande shared that as an institute, it didn’t want to be left behind and this will also give the students a chance to be a part of the day-long conference. “We need to try otherwise the healthcare divide will increase like we have in other industries,” he said before ending his insightful conversation. The one hour session divided among three experts talked about case studies in the Pharma world powered by digital. He also focused on how content plays a big role in Pharma too by giving the example of #CleftToSmile and how mobile holds the key of future success. He ended his talk by emphasizing on having a good design and right functionality. Rahul left the stage for Rupali Digrajkar from Merck to discuss on the why of Digital in the Pharma sector. She talked about her journey to Pharma world as a marketer from a company like Sunburn. Commencing with a lovely video, followed by a humorous talk, she talked about how the digital world is impacting Pharma along with a case study. Her talk emphasized on the ROI of digital in Pharma – “It’s not always sales but it is also about brand building, reach and resonance you get from a campaign.” Further on she shared about the Parents of Fertility from her organization, how they did and the results of the campaign. The third and last speaker of the talk in the session was Pooja Krishnani from MSD who stressed on leadership and digital capabilities for Pharma marketing. After setting up the talk with the Why part on Digital, she focused on case studies that informed how doctors are consuming internet aggressively. However she also added that digital cannot remove the face-to- face interaction, but you do need digital to make customer experience better. Thereafter she focused on what has changed with digital playing a big role in today’s times – “Medium of expression and interaction has changed. Digital is amplifying the power and scale making marketing more real-time, continuous and personalized.” But she isn’t happy with the way Pharma has progressed in the market since it is too much focused on regulations and moving away from customer centricity. The last session before lunch was quiet a tough ask for Ratan KK from GutsGo who had to ensure audiences focused on his talk and not rushed to the lunch counter. The session started with Facebook Marketing; he focused on how life has become difficult in Facebook Marketing because of how the network has changed over time. Moving ahead he shared on how Pharma people should focus on generating leads and paying customers from digital. He also emphasized that implementation of campaign should be 360 degrees and not in silos.